Note: The first paragraph is the Alduin entry found in Varieties of Faith in the Empire. 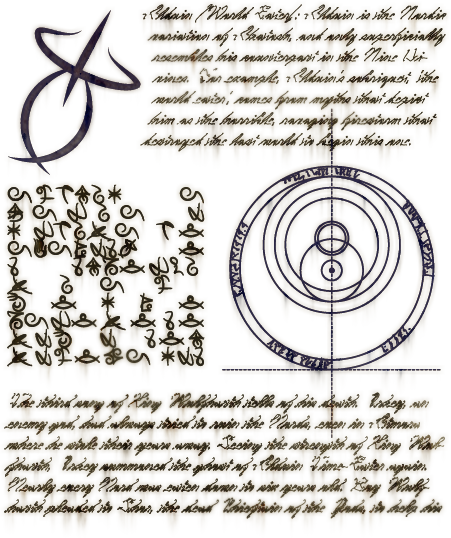 A deciphered version of the second paragraph, written in the "Mage Font", can be found at The Imperial Library. The third paragraph is almost three full sentences from the "Old Knocker" song of the Five Songs of King Wulfharth. 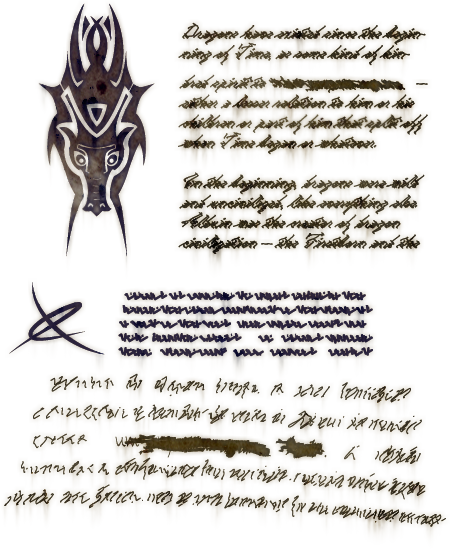 The obscured fourth paragraph says, "Dragons have existed since the beginning of Time, as some kind of kindred spirits to (crossed out text) -- ???? & lesser relation to him or his children or part of him that split off when Time began or ---. In the beginning, dragons were wild and uncivilized, like everything else. Alduin was the creator of dragon civilization - the Firstborn and the". The subsequent paragraphs remain indecipherable at this time. This page was last modified on 22 April 2018, at 02:32.